This is a beautiful 1893 Vuillemin map of the French department of Gironde. This coastal department is the seat of the Bordeaux wine region and produces many of the world's finest reds. Shows numerous vineyards and chateaux. 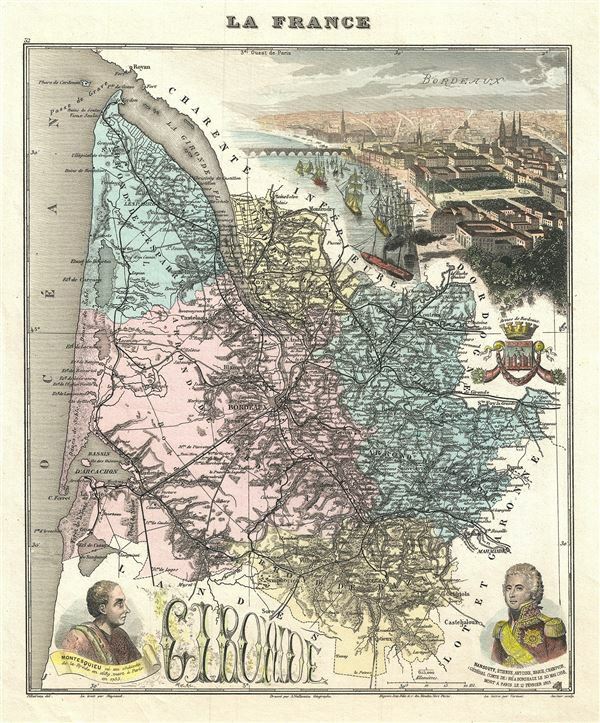 The map includes a beautifully illustrated view of Bordeaux along with portraits of Montesquieu, the French political philosopher and Nansouty, the French cavalry commander, both born in Gironde. Also includes the illustration of the coat of arms of Bordeaux. The map was engraved by Migeon and published by Vuillemin in 1893.